In August, I had the pleasure of presenting with Chip Conley, founder of Joie de Vivre Hotels and author of Peak: How Great Companies Get their Mojo from Maslow. Chip’s latest book, Emotional Equations, has been translated into 11 languages and dashed to the top of the New York Times best seller list this past year. So, what do Chip and Abraham Maslow have in common? They both adore pyramid-based modeling. Yes, this is true. You do recall Maslow’s hierarchy of needs, right? Maslow’s hierarchy certainly seems to offer no actual expiration date; its relevance proves sensible still today. Perhaps they will seem controversial to you, especially if you inhaled the corporate air for some time, or if you have fallen to your knees in exhaustion due in part of the super Machiavellian-like behavior of so called “leaders” in your work world. Regardless of the scars, try inhaling some love at work through Maslow. Quickly you may find your self and others—if you dare spread this message to comrades—healed or re-energized about the possibility of the workplace becoming a healthy dwelling place at last. I know at Alex and Ani we don’t just believe in his motivational pyramid, we teach a course on it—the course is called Minding Maslow. 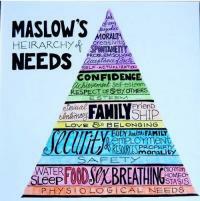 We like Maslow here and, perhaps, you will soon grow to love him too. In my recent chat with Chip, he shared with me some of the ways Maslow referenced cleaning one’s brain. For a few years now, I’ve called it a “psychic scrub” and, as luck would have it, confirmed by Chip who holds one of Maslow’s last diaries, having “psycho hygiene.” I nodded when he validated my suspicion of the power of Maslow’s words that I am about to share with you. Assume everyone is to be trusted. Assume that everyone is to be informed as completely as possible of as many facts and truths as possible; i.e. everything relevant to the situation. Assume in all your people the impulse to achieve, assume that they are for good workmanship, are against wasting time and inefficiency, and want to do a good job, etc. Assume that there is no dominance-subordination hierarchy in the jungle sense or authoritarian sense (or baboon sense). The dominance is of the “chimpanzee” sort, older brotherly, responsible, affectionate, etc. Assume that everyone will have the same ultimate managerial objectives and will identify with them no matter where they are in the organization or hierarchy. Assume that the individuals involved are healthy enough. Assume that the organization is healthy enough, whatever this means. Assume the “Ability to Admire” (to be objective and detached) in a special sense, i.e. to be purely objective not only about other people’s capacities and skills, but also one’s own. We must assume that the people in organizations are not fixated at the safety need level. Assume an active trend to self-actualization – freedom to effectuate one’s own ideas, to select one’s own friends and one’s own kind of people, to grow, to try things out, to make experiments, and mistakes, etc. Assume that everyone can enjoy good teamwork, friendship, good group spirit, good group harmony, good belongingness, and group love. There are 24 more statements that Maslow made en route to explicating “Enlightened Economics and Management,” and perhaps our work worlds have ripened to a maturity level where “minding Maslow” may not be such a bad idea anymore after all?